1. Combine 1.5 litres (52 fl oz/6 cups) water and the shiitake mushrooms in a saucepan. Bring to the boil, cover, then reduce the heat and cook for 20 minutes or until the mushrooms are tender. Add the ginger, mirin and soy. Add the clams and cook for 2-3 minutes or just until they open. 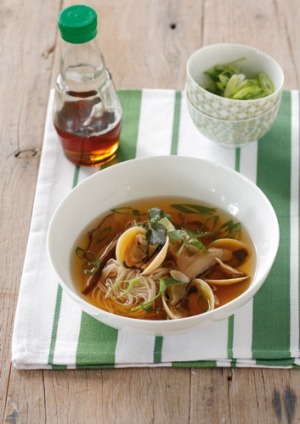 Remove the mushrooms and clams from the stock. When the mushrooms are cool enough to handle, trim the tough stems and slice the caps thinly. Return the mushroom slices to the liquid. 2. Cook the somen noodles in boiling water according to the packet instructions, then drain well. 3. Add the sesame oil to the broth. Divide the clams and noodles among shallow bowls, twisting the noodles into neat bundles, then gently ladle over the hot broth mixture. Garnish with the sliced spring onion and watercress sprigs.